I watched the movie just days before hitting 100 days and the audience occupancy wasn't as full as the movie Happy Days. Actually, since I live in the U.S, I had three opportunities to see the movie but all failed due to work. But I feel quite happy that I didn't waste $10 in a lousy theater but rather Rs. 35/- to see it in a A/C theater. Anyways getting to the point, the movie was pretty average. 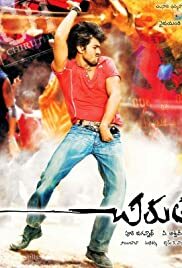 Ram Charan does average for a new comer but his debut was hyped a little too much. But he can dance damn good though. Cinematography by Shyam K. Naidu was good but he good have given a better look and feel when shooting beautiful locales in Bangkok. I felt that the movie was quite boring, seeing all routine stuff. There aren't any worthy scenes/dialogue to mention as they are the "usual". Songs in the movie are pretty good and I think that pretty much makes this movie watchable.